Many sportsmen who are proficient at shooting clays may struggle when they try their hand at game hunting because the flight of a clay pigeon is much different to the way a game bird flies. Different species of game birds have very different speeds and wing movement. The difference between shooting clays and shooting pheasant and partridges is that, a clay starts to slow down literally seconds after departing the trap. A clay is decelerating the moment it leaves the trap and may be anticipated by the shooter. A flushed game bird, is going to be accelerating till it gets to its greatest flying speed, which it will keep till it perceives it’s away from danger. Clays decelerate, birds speed up. Remember this, as many hunters think it is important to go to a clay shooting ground for a bit of practice just before a driven pheasant shoot. 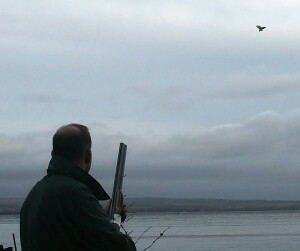 Focus on the types of clays which are like the flight of pheasant in a driven shoot. Crossing, high and rising shots are ideal. The pheasant and the partridge travel at different speeds and have unique wing movements, consequently shooting pheasants and partridge on the same drive could be a effective sporting task. Partridges usually fly closer to the land, with interspersing bouts of wing flapping with shaky glides, creating a whirring sound as the wings flap. The fast wing-beat and small body size have a tendency to give an sense of high-speed, however the bulkier and bigger pheasant is far faster, which is why that each bird requires different levels of lead. To do a partridge justice and avoid missing in front It is best to cut back the lead by a 3 rd or even a 1 / 2 what you’re serving up to the pheasant to check out what happens. Half the joy of shooting a ‘mixed drive’ is at having the capacity to make immediate and proper adjustments when you’re facing a partridge and pheasant in the sky simultaneously, and heading in your direction. Partridges usually fly somewhere about the 30mph level and pheasants can achieve speeds between 30 and 40 miles-per-hour. A pheasant likes to lift off through the open air in an unblocked forty degree angle to the terrain. Getting much better presented birds from flat wood land ground is determined by the angle at which they flush and get above the ground, thus a definable flight way needs to be created by felling any obstructing trees. If these rising areas are thoroughly cut over the breadth of the flushing area, you should also manage to enhance the spread of birds presented to the Guns. There’s an advantage to taking a bird a bit out in front, over one immediately overhead, in that it needs a lower forward allowance and you may get a 2nd shot off at another bird with less effort before the bird crosses the line. But, taking birds in-front sets a greater focus on timing, plus it’s all to easy to make a hash of things. What we must realize is that lower to medium height birds are simpler to shoot at than high ones in front. Looking to hit really high birds well in front could have really mixed outcomes as such birds tend to be out of your range till they are over head your position. To acquire far better results when shooting pheasants, you might practice with clays trapped off a high tower. For more information on the Illaunmore pheasant shooting or for pheasant shooting availability or check out the blog for the latest posts on pheasant shooting.